Image Size: 17"w x 34"h.
The concept for the "Neon Gunslingers" series evolved from a love of the figure and the nostalgic pull of a piece of iconic Americana: the neon sign. Though known as a figurative artist, Blessing’s attention was caught by one such sign in Montana and soon vintage neon came to life on his canvases. "Neon Gunslingers" is a series of larger-than-life symbolic and historical characters is rendered in a new contemporary fine art style – the Neon West. The ultimate Mexican standoff, this set of gunslingers will set the tone of any room in which they hang. 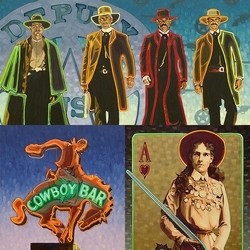 Available as an oversized Museum Edition or MasterWork Fine Art Giclee Canvas, "Neon Gunslingers" is also offered as a Triptych Fine Art Limited Edition Canvas set (each figure is a single unit).